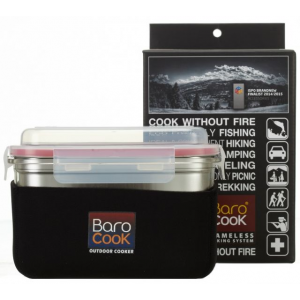 A reliable alternative cooking system without a flame, BaroCook uses a common and relatively safe chemical reaction using Calcium oxide (quicklime) to rapidly heat water to rehydrate meals, or heat water. Not light, but a very useful cooking system! 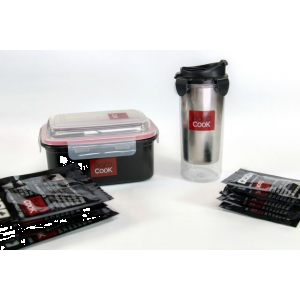 This cooking system brought quite a bit of interest to me, but without the limitations that MRE’s (Meal Ready to Eat) have. I have become increasingly interested in finer dining when I go backpacking, and this system is designed to rehydrate food, and heat water. I have adopted using a SuperCat style alcohol stove in recent years, and am always looking for other options. 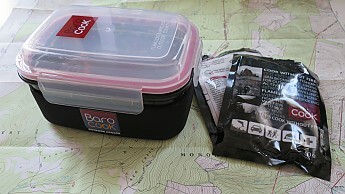 BaroCook system with sealed heat packets. 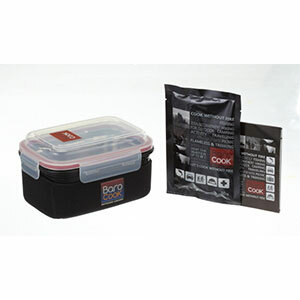 Description: Locking lid, Airtight silicone ring, removable stainless bowl, outer container, neoprene outer cover. Locking lid with silicone gasket. 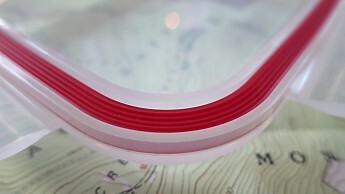 Close-up of the silicone gasket. 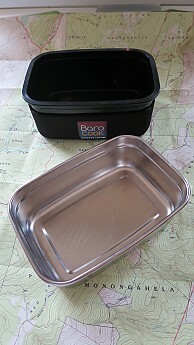 Outer container with neoprene cover (top), inner stainless bowl (bottom). Front and back of heat pack. 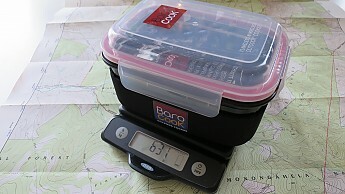 Total weight of the BaroCook system with 5 heat packs. Sorry about the background noise, Red Creek wouldn't settle down for the video! 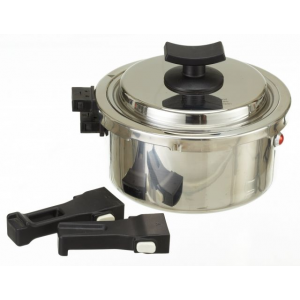 Features: Outer container with removable stainless steel inner bowl. Neoprene cozy for handling hot containers. 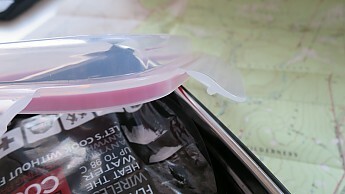 Snap-locking lid with air-tight silicone ring. Individually wrapped Calcium oxide fuel sources with a marked water measuring line. 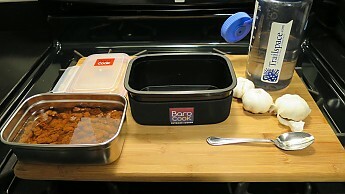 Ease Of Use: The BaroCook is very easy to use; simply place the quick-lime packet in the bottom of the inner bowl, fill water to marked volume on quick-lime packaging, and pour into inner bowl. Once the chemical reaction begins, the pouch starts to steam. Carefully insert stainless inner bowl, add food/water, and snap the lid shut! Note: it is VERY IMPORTANT to place the inner bowl into the outer AS SOON AS you pour the water, once the BaroPack begins steaming, it will VERY EASILY burn your hands! Rehydrating chili at home with the BaroCook. Construction & Durability: The stainless inner bowl (18/10 gauge) had noticeable scratches after initial use. 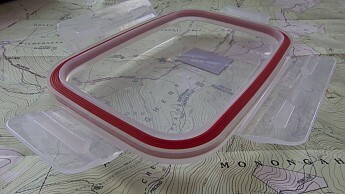 The plastic lid and outer bowl appear to be well made, the silicone gasket sufficiently seals moisture. There is a long-term durability concern with the locking hinge mechanisms however. I suspect the thin plastic at this area to fatigue over time, and when it breaks, what you have is a plastic container for the kitchen (see image below). Closeup of the lid, locking mechanism, and hinge. 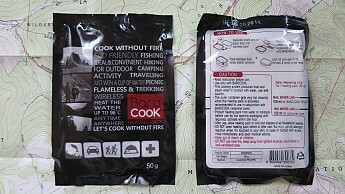 Conditions: BaroCook was used on a summer backcountry trip to Dolly Sods Wilderness, Monongahela National Forest, W.V. Tested on a day hike in the Shawangunk Ice Caves, Catskill Mountains, N.Y. Tested at home. I wanted to show some weight comparisons of a few popular cooking systems, as there are several factors to consider weight-wise. Weight compared to JetBoil Flash: 14 oz plus fuel canister, 6.8 oz (small), 12.6 oz (medium), 22.8 oz (large). Compared to SuperCat Alcohol Stove: .3 oz plus fuel .9 oz per ounce of fluid. This is clearly a comparison for those who use a flame to cook… the only real direct competitor is using an MRE, which is also kind of incompatible. Comparing to a MRE (thereadystore.com), one full meal at 1200 calories weighs in at 1.2 lbs. I cannot seem to find the amount of weight after the food is consumed, but this REALLY adds up in the calorie/weight ratio. Adding in the $10.91 per meal figure, ouch! Here’s my main concern: I don’t typically heat just one item when I am cooking in the backcountry. With breakfast, I might be heating coffee. With dinner, it might be hot cocoa or a hot toddy. The challenge here is that one must remove the inner bowl (that’s very hot when active) to pour the hot water into a cup before heating up one’s main course. If you can even come up with a system to pour it out, it would only be a matter of time before getting burned by either hot water, or steam. Judging by the amount of time you have to work with, a second precious package would be needed to do this safely. Now if you want two hot items two times a day, 1.9 oz (per heat pack) x 2 (heat packs) = 3.8 oz x 2 (times per day) = 7.6 oz of fuel per day. For simplicity, let’s look at a 3 day/3 night trip; that is 23.3 oz of fuel, plus 12.6 oz for the cooking system, and you have 35.9 oz. Also bear in mind that you are packing out all of the weight of fuel after it is consumed. According to the BaroCook website, this cooking system retails for $33. Ebay.com sells the product (with one 50g pouch) for $59.99 shipped. Not sure, but possible model (specified as large) found on amazon.com for $42.99 + $16.99 S&H. If I were to go on a trip where fire is not permitted, I think this would be a wise consideration. 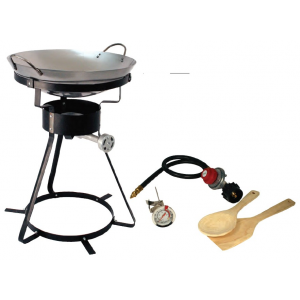 I think this cooking system has its place in the outdoor community, however I just can’t quite get sold on this system for several reasons. The first concern should hopefully be worked out soon, and that is price and availability of the product. I’m not sure if BaroCook’s marketing campaign just hasn’t landed on US soil yet… The primary concern is that this system isn’t really designed for ‘cooking’. It is really a product that is intended on rehydrating food. The second, and main concern is overall weight. This system proves very useful where one cannot have a fire, but at a heavy cost! Thanks for testing and reviewing this unique product, Sean. I could see it's benefits in the fire prone west. Also, on extended underground caving expeditions, this would be a bonus (I've tried heated MRE's underground with varying success.) Thanks for the review! What a great review, very thorough and good comparisons. One of the things I love about a trip is that the weight comes off my back as fuel and food are consumed. 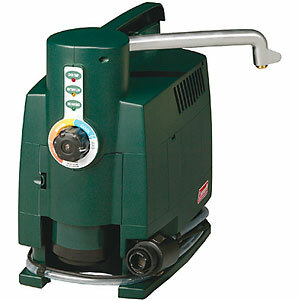 The idea of adding weight in the process of using the fuel goes against this. I don't think I could get past that, even if the weight is pretty minimal. Plus, it seems kind of wasteful. Goose has a good point about using it in areas where combustibles are not permitted or would be dangerous (in a cave or tent). Thanks for your review. I think this product could be great in a tent up high, or in a cave - two environments where hot food is nice and flames are not.